An unknown artisan crafted a shining gem in the fire of fusion. After this technology was invented, people were impressed by the beauty and power of this kind of gems – The Fusion Gem. The Fusion Gem is new and more powerful. Different to the Gem we had before, the Fusion Gem have Two Stats Bonuses! This means you can actually save a slot to another Gem. One more Stats Bonus also gives you higher Char Stats and Battle Rating. Fusion Gem can make you stronger. 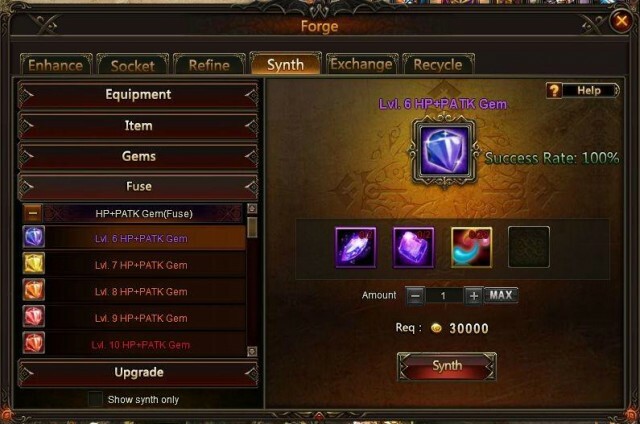 Now you can Synth your own Fusion Gems. Open the Forge menu and choose Synth, find Fuse on the left column. Use The Lvl.6 HP+PATK Gem as the example: You need to have 2 Lvl.6 HP Gems, 2 Lvl.6 PATK Gems and 20 Gem Essences to Synth 1 Lvl.6 HP+PATK Gem. You can also upgrade the Fusion Gem. 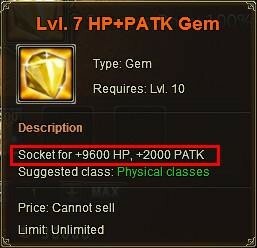 Use The Lvl.7HP+PATK Gem as the example: You need to have 3 Lvl.6 HP+PATK Gems and 400 Synth Scrolls to Synth 1 Lvl.7 HP+PATK Gem.